At a place called, “the Forks of the Little Pigeon River,” you’ll find the town of Sevierville founded in 1795. Arriving at Sevierville the county seat of Sevier County you can’t help but notice the tower of the old courthouse in the historical district of Sevierville. Since earliest times this location at the Forks of the Little Pigeon has been a location for the region's inhabitants. Across from the library in Sevierville is a Native American Mound that predates the Cherokee People. These mounds were located near a waterways and used as ceremonial sites, spiritual grounds or burial mounds and often locations where the Principle Chiefs would have likely live and ruled. 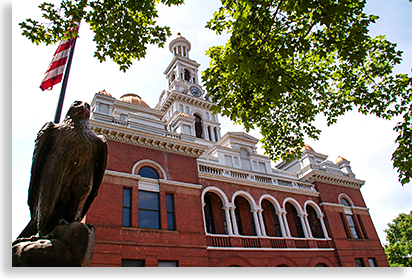 The Historical Sevier County Courthouse was completed on November 10, 1895 and is considered a good place to start your visit to Sevierville. The heart of the county can be found on the grounds of the courthouse. The rise and prosperity of the community displays itself on these grounds, the grandeur of the courthouse and the surrounding historical buildings present a fine example of Sevier County’s prominence at the turn of the 20th century, this was the center of the world for county residents. On the courthouse grounds are plaques, statues, and commemorations. A statue of a eagle draped overhead by a flapping display of old glory’s red, white and blue honors a memorial to the men of the military, a military that has served two nation both the Confederate States of America and the United States of America. A bust of the Colonel John Sevier is also found on the grounds commemorating his achievements in the Sevier County region, he is also recognized as one of Tennessee's founding fathers. A very unique full size statue also graces the courthouse grounds, a special local celebrity who helped put Sevier County on the map, the entertainer and entrepreneur giant Dolly Parton. The folks of Sevier County consider the fame of this local small town girl as bigger or rather more renowned than the Great Smoky Mountains. In human character I have to agree with the crowd. In Sevier County, Dolly Parton is not just revered as a local country cutie whose talent took her to the top of the music charts and entertainment field, but also as someone who saw a new vision for one of Tennessee’s oldest counties. Dolly Parton’s achievements have given her right to the mantel as being one of the new founding ladies of Sevier County in the late 20th century and in to the 21st century. 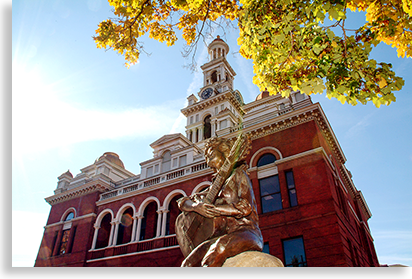 Sevierville’s courthouse grounds and the immediate downtown area have seen little change in the last 100 years, it often seems relatively quiet here in mid downtown Sevierville. Even at mid-day mid-week its like a time warp holding to the past, yet one block in any direction the town is alive and bustling due to its expansion and the number of vehicles buzzing around. A boom in lodging, dining, shopping malls, live entertainment, museums and amusement parks just to mention a few attractions has transformed Sevierville into a choice vacation destination with all the local outdoor recreation Sevier County has to offer. Following highway US 441 south through Sevierville you will find yourself on what’s fondly known as the Parkway (US 441 south.) The Parkway takes you down a wide thoroughfare flanked on each side of the highway with a large and diverse array of businesses and amusements. This wall of attention grabbers continues south for miles towards the giants themselves, the Great Smoky Mountains, stretched out across the southern horizon. This “Gateway to the Smoky Mountains.” draws millions of visitors up and down the Parkway corridor throughout the year, from Sevierville through Pigeon Forge to Gatlinburg. When you visit you should enjoy all three have to offer. The only thing that visibly separates the city limits of Sevierville from city limits of Pigeon Forge is a Welcome to Pigeon Forge sign.